The only person in the world who has ever loved me unconditionally is Mary Beth Zolik. We have been best friends since we were in our early twenties. She was just diagnosed with Non-Hodgkin’s Lymphoma. I can’t, won’t consider life without her. We met when we were rookie reporters in Charlotte, North Carolina. To this day, we giggle when we recall what drew us together. We were both covering a school board meeting for our respective stations. I was in TV News. She was in radio (still is). We were sitting on opposite sides of a room separated by a single aisle. Another reporter had just collected her microphone from the front of the room. As this woman walked down the aisle and got closer to where we were sitting, on opposite sides of the room, Mary Beth and I couldn’t take our eyes off this woman’s legs, covered in white opaque tights… and black leg hair–lots of long black leg hair…all sticking out of her white tights. She was a TV reporter, so we found it sort of shocking. When this woman passed where we were sitting, Mary Beth’s and my eyes met across the aisle. We instantly knew what the other was thinking…and we laughed. That was it! The moment the meeting was over we introduced ourselves and became best friends forever. Just like that…inseparable for the one year we both worked in Charlotte …and ever since…easily and intricately in each other’s lives, no matter where in the country our respective careers took us. Since we were 23, we’ve planned to retire to the same city…we’ve always imagined ourselves like “The Golden Girls”, carrying pocket books with shells glued to them and painting our lips past the boundaries. 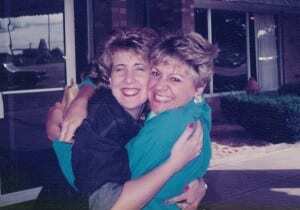 Even our parents, hers in Detroit and mine in Boston, became loving friends. Before she married Terry Smith and had kids; Tara, Derek, and Cullin (my Godson), we traveled the world together; China, Africa, Europe. We’ve joked that we must have been the Bronte sisters in another life. We have the ability to know what the other is thinking and to finish each other’s sentences. We have purchased the same bedspread and the same Andrew Wyeth print for our homes, without knowing it. Eerie! On a Switzerland trip, we both secretly carried the soundtrack to ‘The Sound of Music”. The moment we crossed into the Alps, we each pulled the audiotape out of our purses… laughed until we had tears streaming down our faces. I will be there through every step…as she would be for me. That’s the gift of unconditional love. All prayers welcome! Thanks, Becky! You’re right. It is a priviledge to have a wonderful best friend. I feel very grateful…and hopeful that she is going to be just fine.